The following section contains a description of all possible controls. 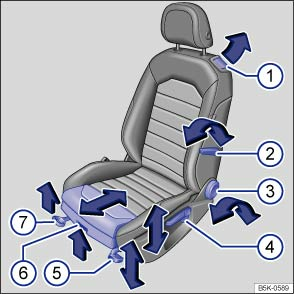 The number of controls may vary depending on the version of the seat. The seat may have a combination of mechanical and electrical controls . ① Folding the seat backrest forwards or backwards (2-door vehicles only) Folding forwards: Pull lever and fold seat backrest forward. Push the seat forwards at the same time. Folding backwards: slide the seat back as far as it will go until it clicks into place. The backrest releases automatically and can be folded backwards. Engage the seat backrest in an upright position. ② Adjusting the lumbar support. Change lever position. ③ Adjusting the backrest. Take all weight off the backrest and turn the handwheel. ④ Adjusting the seat height. Move the lever up or down several times as required. ⑤ Adjusts the angle of the seat cushion. Pull or press the lever several times as required. ⑥ Adjusts the seat forwards and backwards. Raise the handle and slide the seat forwards or backwards. ⑦ Pushing the front seat forwards or backwards. Lift the handle and move the front seat. The front seat must engage after the lever has been released.